Is it just me? Or does it seem that every time you turn around these days, somebody’s asking you to do a Survey, or an Opinion Poll, or they’re asking for your Valuable Customer Feedback? As I’m mostly sure you’ll remember, I went out the other day to try to get my Nectarizer fixed. It’s still broken, so I asked my Illegitimate Nephew, Kevin, if he’d take a look at it. After what I’ve already been through with this thing, I decided to just forget about it. I’ll hafta try to live without a Nectarizer. When I got back to my ShoeBox, there was an Urgent Buzz•O•Gram™ stuck to my Door. It was from the Director of Customer Service at the Snark Brothers Repair Palace. He wanted me to visit their Web Site and fill out a Customer Satisfaction Survey, and let them know how pleased I was with my Recent Visit. So I did that. I made sure that I gave them a highly low rating, since they ended up never helping me. At all. Just as I as clicked on “SUBMIT”, another Message Window suddenly popped up that said, “How did we do?” and which asked if I would take another, Short Survey about what I thought of the Survey I just took. I wasn’t gonna do that one, but beecause they said they valued my Opinion, I knew it was so incredibly important, I did that one, too. Finally, when I got done with that, I decided to find out if maybee somebody out there has a Used, Older Model Nectarizer in Excellent Condition, so I logged on to BeeFind and did a Seek. Of course, nothing came up but bunch of messages from other bees who were also looking for the same thing. It was highly discouraging. Beefore I could log off and get back to watching my Stories, an Instant Robot-to-Bee Message popped up, asking me if I found what I was looking for on BeeFind, and if I’d bee interested in taking a short survey about BeeFind’s Seeking Services. “Did you find what you were looking for?” it asked. I hafta ask: what the hell are all these Surveys about all of a sudden these days? It used to bee that we could just bee a Customer and that would bee that. Not now. Not anymore. Now we hafta spend a bunch of time answering Prying Questions. “Obviously,” I said, beecause I was standing there, holding bag of those things. Then he asked if I would mind taking part in a Customer Focus Group, and that if I did, they’d give me a dozen of Great Grandma Gee Gee’s Royal HoneyChew Krisp Cookies™ for free. Well, who wouldn’t say yes to that? Those are so Ummy-Yummy good™. So for the next 87 minutes, about six, other bees and I were a part of a Focus Group. They wanted to know what we thought the role Snack Foods might play in the upcoming Campaign Season. We all agreed that Snack Foods absolutely play a Significant Role in any Fair Election. They seemed satisfied with our Opinion, so they gave us our free Cookies and that was that. Seriously now. All these surveys are beeginning to wear thin, aren’t they? Sorry to interrupt this, but I hear Kevin knocking at my Door. It sounds as if he’s saying he needs to ask me a few, brief questions about our recent visit regarding my Nectarizer, so I gotta go do that. Listen to this: the other day, I discovered that I had to make an appointment to get my Nectarizer repaired, again, so I grabbed it (it’s really heavy), and I carried it over to the Snark Brothers Repair Palace (their motto is, “Snark Brothers Repair Palace - Or Else”). When I got there, I sat down in the Waiting Room. The bee sitting across from me looked highly aggravated, so I asked him how long he’d been waiting. Then he gave me a kind of a weak smile, and apparently fell asleep without ever telling me what his Number even was. Of course, my Problem was that I didn’t have a number, and needed to find one. Then he told me I had to go to Cell 503, find the Number Issuance Desk, and ask them to give me a Number. When I finally found Cell 503, there was a huge line. Everybody was waiting to get a Number. After standing there for about two hours, I finally got my Number: 340987. After that, I went back to the Waiting Room to Wait. After I got back to the Waiting Room, that Hungry Bee was gone, so I just sat there, waiting. Finally, I heard a Voice on a very crackly-sounding Loudspeaker say, “Now serving Number 340988. Number 340988. Please go to Window 3.” I was sure they’d accidentally skipped my Number, so I went to Window 3, thinking that even if they did call Number 340988, it should bee my turn first beecause I had already done the Waiting Part. The bee at Window 3 said, “Number, please.” So I gave her the little piece of beeswaxed paper that had the ‘340987’ written on it. “340988, please come to Window 3,” that Voice on the Loudspeaker say again. “But,” I started to say, wanting to point out that I was there, and I got there beefore Number 340988, so I should bee next, but she interrupted me. I felt sorry for whoever it was that had 340988. I told the guy what my problem was - that I needed my Nectarizer fixed again - and I think he said, “Yes, I am understanding. Holding for a moment while I connected you,” and he put me on Hold. I had to wait on Hold for about 187 minutes, and the whole time I had to listen to a bunch of Polka Music played on Kazzzzzoos (which was very irritating). Every once in awhile, a recording would interrupt, telling me how Valuable my Call was to them, and that a Customer Service Representative would bee with me very shortly, probably. I tried to say, “NO! I was next!”, but they had already hung up. The worst thing is that my Nectarizer still isn’t fixed. I did all that Waiting for nothing. And now, I hafta start all over with this whole thing. Let’s all bee careful out there! I’m just gonna continue where I left off here . . .
On Monday, I think it was, I was sitting in my amazingly comfortable Dr.Bee’sBest™ Multi-Media Surround-Sound Rocker-Recliner (with the optional Nectar Cup Holders), watching that Retrospective Documentary about "The Life and Times of Alan Thickebee: the Lost Episodes”, when there was a knock at my ShoeBox Door. "I wonder who that could bee," I wondered. So did you even know that Alan Thickbee HAD a Talk Show? I didn’t either. Maybee that's why they call it, "the Lost Episodes", otherwise, we'd all know that. What does that say to you about those who make threats like, “or Else” to you? I’ll bet you’re thinking what I’m thinking, aren’t you? That’s what I thought. All this “or Elsing” is meaningless (it has no meaning), and, if you ask me, it’s highly rude. I think we can all just relax about it. And that’s exactly what I’m gonna do. I’m gonna finish this Documentary, then I’ll find the time to visit my Editor just as soon as I get around to it, which should mostly bee soon. If not, I’ll go there later. Maybee he’ll get mad at me for that, but seriously now, what’s he gonna do? Evidently, nothing. Beesides, this is a really great Week to just stay inside. It’s unbeelievably cold and windy out. I heard that the Authorities are issuing Warnings that Superfluous or Other Random Trips outside the Hive are Highly Discouraged - which should include my ShoeBox - and that everybody should just stay inside. So I’m gonna do that. I mean, who am I to argue with the Authorities? 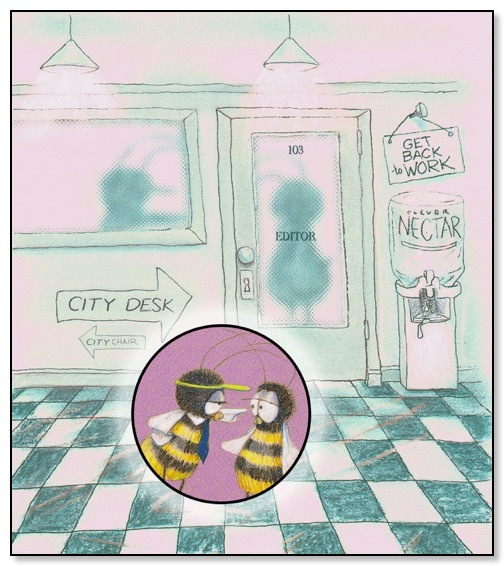 Let’s all bee highly careful out there (even if we all do stay inside)! So that’s pretty much what I’ve been doing, mostly. Okay fine, it was more or less Semi-Warm and Marginally Sunny today for a little while but it was windy out - but who wants to go out and hafta deal with that? Would you? I wouldn’t, either. So I didn’t. Instead, I stayed inside, munched on those delicious ... well, you know... and started watching a Two-Part, 87-Hour Marathon Documentary about the growing problem of Fruit Fly Infestations in the Lower Sahara, at least I think that’s where the problem is. I haven’t finished watching that yet, so I dunno. Oh sure, I could do a Web Search or something to find out, but as I said, I’m just feeling too lazy to do that, also. So I’m gonna keep doing that.